President Bob Orciari opens our trail system to the gathered crowd of hikers. 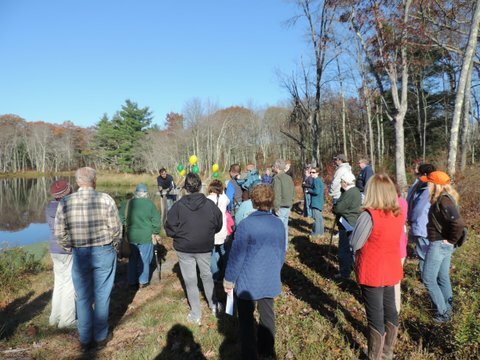 On October 25, 2014, the Trust held a Grand Opening for its newly established trail system through the 50 acres of woodland adjacent to Bull Pond. The weather and foliage was perfect, and we had an excellent attendance of about 50 visitors throughout the morning’s event. All visitors said that they were very impressed with the new trails and with the attractiveness of the area. They were led through four separate, but interconnected trails. Hikers found the trails to be well-marked, dry and easy to walk. We were impressed by the number of seniors that hiked the trails, especially a 93 year-old lady who completed the loop to the back end of Bull Pond. We hope the hikers that came to the Grand Opening will pass their experience onto their friends—they’ll be surprised at how nice the area is.